MIÑOZA, m.n., Spanish from Galician or Latin, Toponym. Derived from the Spanish word miñosa, which has two possible origins. It could be a variation from the Portuguese minhoca, in turn from the Galician moñoca, which means "earthworm". It may also be of Latin origin from the word minium, which refers to a red dye. As a family name it only appeared in Argao, Cebu sometime in 1859 when Maximiano Miñosa migrated to Argao. He married an Argawanon, Eusebia Nazareno. Maximiano and Eusebia later went back to Cebu City where their five children were born and raised. His first cousin, maestro Cornelio Miñosa, was assigned to Argao in 1873 as the pueblo's schoolteacher for boys. The Miñosa family was a prominent middle-class family from Talamban, Cebu. A son of Maximiano, Alejo, was an active general in Cebu in the revolution against Spain while Cornelio and two of his sons were three of the leaders in the revolution in the southern portion of Cebu. The original spelling of the name was Miñosa, though most present-day members use a "z" instead of an "s". (1) Maximiano Miñosa & Eusebia Nazareno - married in 1860, had three daughters and two sons. Descendants carry the last name of Miñosa. A. Don Antonio Miñosa m. (1) Loreto Lucero & (2) Nemesia Lucero-Villanueva Diez - descendants in Argao and Mindanao carry the last name Miñosa. 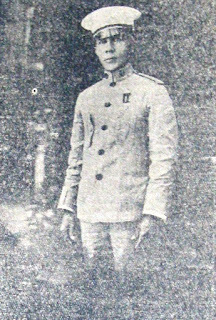 B. Gen. Bonifacio Miñosa m. Sabina Kintanar - no issue. C. Apolinar Miñosa m. (1) Margarita Cabrera, (2) Francisca Lucero, (3) Gallendo - descendants carry the last name Miñosa. (3) Florentino Miñosa & Ysabel Escalante - married in 1902. Florentino later followed his older brother Cornelio to Argao. In the same manner as his brother and first cousin, Florentino also married into the Nazareno-Albores family by marrying Ysabel Escalante, who was also a niece of Eusebia Nazareno and a first cousin of Saturnina. They had two sons. A full history of the Miñosa family is available. Please contact the genealogist if interested.